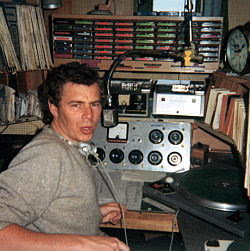 Ian MacRae worked on Radio Caroline during 1966 and 1967 when British offshore radio was at the height of its popularity. In a recent review of “The Boat that Rocked”, he took issue with how the movie portrayed this famous pirate broadcasting operation. 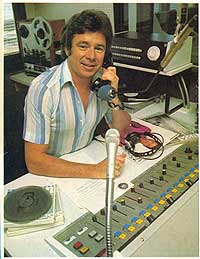 Today he's a "floater" for 2UE radio in Sydney, Australia and runs the Ian MacRae Radio School. Corey: You worked on Radio Caroline during 1966 and 1967 when British offshore radio was at the height of its popularity. In a recent review of “The Boat that Rocked”, you took issue with how the movie portrayed this famous pirate broadcasting operation. Can you reiterate some of your pet peeves on this? For instance, no visitors were ever allowed on- for insurance and safety reasons. The idea you could invite 200 fans and have them running all over the ship is ridiculous when you have generators running and transmitters putting out 50,000 watts. Which makes the scene where the two guys compete to climb the mast even more ridiculous. The few visitors who did come on board were people like pop stars and entertainers, for on-air interviews, and they had to have special permission from head office in London. The movie makes no reference to the station even having a head office, which was actually a salubrious building just off Park Lane, but gives the impression the whole operation was totally run from the ship. It also makes it appear there was only one radio ship, which they call Radio Rock, with one DJ telling his listeners he has 25 million people listening to him. In fact there were at least twelve stations that I can think of broadcasting around the coastline, with about six positioned off London, all with a combined audience of 25 million.. And the movie really totally misses the point when the police attempt to raid the ship to close it down. The vessel was in international waters and outside the jurisdiction of any British authority. A raid like that would have been real piracy by the police. Corey: Originally Australian, you’ve had a very successful career on Australian radio. What is the state of AM and FM in Australia? How has Internet radio affected traditional radio? Is there one or two things are you believe separates Australian commercial radio from the United States or even England? Ian: Some stations are going through a tough financial time but, surprisingly, it’s mostly the top rating TALK stations. They have big audiences and are very successful but it’s the obscenely high money they have to pay their top presenters that is taking a big slice of the profits. eg: Alan Jones on Sydney’s 2GB which has been number one for several years now. The FM music stations seem to be holding their own having embraced social media through their websites, streaming, podcasts, mobile phones etc. It’s also interesting that the national broadcaster, the ABC, has more people listening to its’ Radio National channel through podcasts than it’s live on-air programs so they’ve effectively more than doubled their audience. I don’t believe internet radio has had much of an impact on terrestrial radio although this may change as more of those internet enabled receivers come on the market. Differences in Aussie radio compared to U.S or UK radio? Apart from the accents (! )...not a great difference. While networking is still big, there is a move back to more local programming. (hooray!) UK commercial radio is still very young and I sometimes feel the presenters sound a little amateurish and juvenile. Especially music radio. Corey: You operate the Ian MacRae Radio School and train future deejays. Is there hope for future deejays? Seems like we’re a dying breed. Ian: I think deejays as we knew them probably are a dying breed. Presenters now have to be more rounded and able to bring more things to the table (or to the mic) than just being able to announce songs and do liners. Which is why we teach more than just presentation at the school. Our main goal is to bring out the student’s personalities and make them entertainers. Corey: What’s the worst thing that ever happened to you while on-the-air? Ian: There’s been all the usual things we all go through. Swearing while recording calls that were going to air at the same time. I once had a bout of nose bleeds that lasted for a week and seemed to come on the instant I put the mic on every time. And that was before the days of computer play-out systems which you can just switch to automation. Corey: Where do you think radio is headed? Ian: I think a transmission tower will eventually become the least important device for a radio station to make itself heard. It’s all heading toward the internet, phones, MP3 players, Wi-Fi etc. As evidence of this many program directors are now being referred to as “Content Producers”. Corey: If you could institute one law or rule about the radio business, what would you insist on? Ian: Set a maximum number of hours any station is allowed to take network programs.